The Chicago Tribune ran an article on Friday under the headline: “Almost nothing is known about dozens of concealed carry shootings in Illinois. Why?” The article lists 38 cases where a person with a concealed handgun permit discharged a gun. The cases go back to 2014, and Illinois first started issuing concealed handgun permits in February that year. There have been no criminal convictions for any of these permit holders, and just five face criminal charges that are related to their permits. In state after state, the data show that permit holders are extremely law-abiding, even relative to police officers. Our annual reports on the number of concealed handgun permits provide detailed information by state. While the Tribune cites last year’s report on the number of concealed handgun permits issued nationwide, they ignore our discussion on how law-abiding permit holders are in other states. 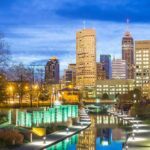 In any case, a number of states such as Florida, Michigan, Texas, and Utah have readily available links where they provide this information. It is easy to figure our the revocation rate by reason for revocation. The Tribune is correct that Lt. Boerwinkle doesn’t have the evidence to prove that permit holders rarely get into trouble because of training. But the Tribune is wrong that there is no evidence on this. Dr. Lott’s “More Guns, Less Crime” (University of Chicago Press, 2010, Ch. 10) shows that training periods are unrelated to the revocation rate of concealed handgun permits for crimes, accidental discharges, or other regulatory violations. One way to look at the data collected by the Tribune is to compare the cases where a permit holder might have unjustifiably shot someone versus cases where a person used a gun defensively to stop a crime. There are at least 30 cases where a permit holder justifiably uses a gun and none yet where the permit holder was convicted for unjustifiably shooting someone. In addition, note that while discharges of firearms might get news coverage, the vast majority of defensive gun uses merely involve brandishing a gun. These 30+ examples are just the tip of the defensive gun uses by permit holders. If someone unjustifiably brandishes a gun they were carrying, they have committed a crime and it is likely that would become a news story. After just over four years with a right-to-carry law, Illinois has over 310,000 permit holders — about 3.3 percent of the adult population. By July 29, 2014, Illinois had issued 68,549 licenses. From 2014 to 2018, Illinois had an average of over 189,000 active permits. Over that same period, no one has been convicted of committing a crime with his permitted concealed handgun. Five individuals face charges, and four of them may have used their guns in self-defense. It is quite common for arrests to be made in cases of legitimate self-defense, and charges usually end in a “not guilty” verdict when they are even brought. Two of the permit holders listed by the Tribune face firearms charges, but not for anything pertaining to concealed carry. So in Illinois, there have been zero convictions for crimes committed with a permitted concealed handgun. Annually, just 0.59 per 100,000 permit holders are charged with such a crime. — Oct. 31, 2017, 8 p.m., Oak Park: Robert Lewis, 56. “An Oak Park man charged with firing a gun on Halloween night said he did so to protect himself. . . . ‘These two individuals were looking to assault me in the alley,’ Lewis said. ‘I am a concealed-carry licensed citizen. I used my firearm to fire a warning shot. '” Cook County State’s Attorney’s Office approved the charge of reckless discharge of a firearm. — July 18, 2017, 2 p.m., Chicago: An 18-year-old woman attacked Keli McGrath, a 46-year-old Chicago police dispatcher. The 18-year-old grabbed McGrath by her “hair and shoved her.” The older woman was taken to Stroger Hospital “for treatment of a head injury.” After being attacked, McGrath pulled out her permitted concealed handgun and shot the 18-year-old. “McGrath’s attorney had said his client had no choice but to defend herself once Garcia grabbed her hair and shoved her to the ground.” McGrath was charge with aggravated battery. — Sept. 9, 2016, 11:55 a.m., Chicago: Michael Arquero, an Emergency Medical Technician and security guard with a concealed handgun permit, was picking up food for his pregnant wife at a taco stand. Gang member Louis Rodriguez was circling the restaurant in his car when someone inside the vehicle started firing a gun. Arquero shot back, fatally hitting Rodriguez. Apparently not understanding what had just happened, two police officers fired at and wounded Arquero as he shot at the car. Arquero was a convicted felon and should not have been issued a CCL. — Sept. 15, 2017, 4 p.m., Wheaton: DuPage County Judge Patrick O’Shea accidentally discharged his gun in his apartment. He was charged with reckless conduct, a misdemeanor. O’Shea was found to be not guilty, though the Tribune omits this fact. — Sept. 1, 2017, 2 a.m., Chicago: Lyft driver Jaleesa Rance allegedly threatened to “blast” two riders with her permitted concealed handgun. She also purportedly used a homophobic slur. The Chicago Tribune piece notes that she was acquitted. — July 18, 2017, 3:45 a.m., Romeoville: Hector Escobar allegedly fired one shot into the kitchen floor of his home. He was charged with reckless conduct and reckless discharge of a firearm. — March or April 2017, Bloomington: Robert E. Witt, 37, was charged with aggravated discharge of a firearm/occupied vehicle, a Class 1 felony. He also faces one count of reckless discharge of a firearm, a Class 4 felony. At their residence, Witt reportedly fired the gun in the general direction of his wife. No one was shot. 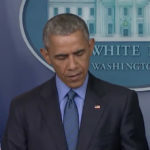 The Violence Policy Center, which supports gun control, said that it relied largely on news reports to compile a list of fatal shootings involving concealed carry holders. Many states, including Illinois, bar release of such information. The center said that it found more than 1,200 such fatalities across the country since 2007 that did not involve self-defense. 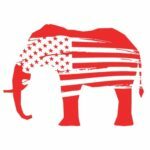 This number includes suicides, murder-suicides, and cases where CCL holders were charged or convicted of murder. . . . The VPC claims that there have been 1,239 deaths over 11 years, but this is the result of massive errors that have been pointed out time and time again. They have never been addressed. Of the 1,239 cases, a truly unbelievable 588 (47.5%) supposedly occurred in just Michigan (69 homicides and 519 suicides — see here). Any suicide by a permit holder is counted, whether it occurred in or outside of the home or by means other than a gun. 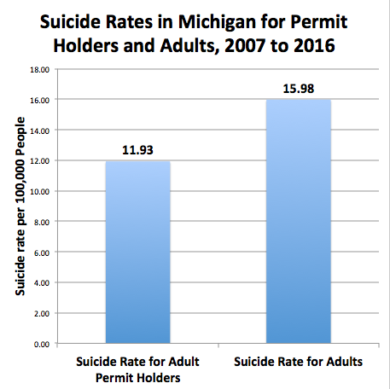 The overall suicide rate among permit holders is 25.4% lower rate than for the entire adult population (looking at the period from 2007 through 2016, there were 11.9 suicides per 100,000 Michigan permit holders v. 15.98 suicides per 100,000 adults in Michigan). The rate among permit holders is calculated using an average of 352,125 existing permits in each year from 2007 to 2016. 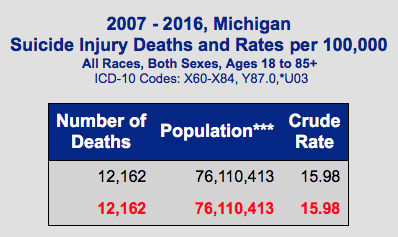 The VPC uses three data sources here: news stories, Michigan State Police reports on motor vehicle deaths that permit holders were responsible for, and Michigan state police reports on homicides by permit holders. Many of the homicide convictions are accounted for both in news stories and in the police data, and using both sources results in double-counting. Also, many of the people that are discussed in news stories are not ultimately convicted. Motor vehicle deaths have nothing to do with whether or not someone has concealed carry. 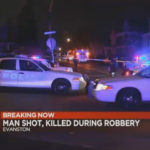 Even the other homicide numbers don’t distinguish as to the method of homicide, so we can determine if concealed carry had anything to do with it. Over 11 years, 24 of Michigan’s half-million permit holders were convicted of homicide (any type of non-motor vehicle homicide), not 69. As in other states, Illinois shows how extremely law-abiding permit holders are. Annually, just 0.63 per 100,000 permit holders are even charged with such a crime, and no one has thus far been convicted. Four of those five cases over almost 4.5 years involved cases that appear to be self-defense shootings. What these cases don’t show is how frequently permitted concealed handguns are used defensively. 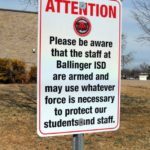 Evidence indicates that the vast majority (something around 95% of defensive gun uses) don’t involve the gun being fired when they are used in self-defense. When you take into account warning shots, much less than 1 percent of cases even involve the gun being fired directly at the criminal. There is little reason to believe that these cases where a gun isn’t fired are reported to police and even when they are, the police don’t record such defensive gun uses in any systematic way and they are very unlikely to get any media coverage. In past research that I have done almost 85% of news stories on defensive gun uses involve someone being killed and the rest someone wounded. Yet, we know that in shootings woundings are about 8 times more frequent than people are killed. The bottom line is that while this evidence shows that the problems are extremely rare, news stories don’t provide direct evidence on how frequently people use permitted concealed handguns to stop attacks.